The 15th Taklung Rinpoche was born in Bhutan on the 15th day of the 4th month of the wood-female-rabbit year in 1975, with numerous auspicious signs, such as the sudden appearance of three natural springs where the color of the water was milky, in front of the window of their house. His family lineage evolved from the famous family lineage of Khochung Choeje - the lineage that evolved from Khendup Kunga Wangpo, the son of the Great Treasure Revealer Pema Lingpa, who evolved from the celestial lineage called the 'Luminous Deity'. In 1977, he was recognized as the true reincarnation of 14th Taklung Rinpoche by His Holiness the 16th Gyalwa Karmapa and H.H Sakya Trizin and then was named as Karma Shedrub Choki Nyima Thrinley Kunchab Pal Zangpo by his H.H. the 16th Karmapa. In 1978, Rinpoche visited Rumtek Monastery in Sikkim (India) the seat of Karmapa and studied there for seven years. There, he received initiations and empowerments from H.H the 16th Karmapa and other great teachers. By 1986, Rinpoche visited the Taklung Monastery in eastern Tibet and started studying Sutras, Tantras and literature from Kagyue Khenchen Karma Tseten, H.H Taklung Tsetrul Rinpoche and other learned teachers. 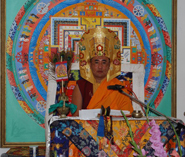 In year 2000, Rinpoche was conferred the title of Khenpo (Abbot), accordance to the Tibetan tradition by Penchen Padma Tshewang among two thousand students/monks. From 2003 to 2007, Rinpoche has worked effortlessly and built monasteries, schools and retreat centers for monks and nuns at Taklung in Tibet. Rinpoche has helped the poor and deprived ones in various capacities. Since 2007, Rinpoche initiated the World Peace Prayers Ceremony with five thousand monks and nuns at Taklung Barthang Thubten Shedrup Ling for the welfare of all sentient beings. Since 2009, Rinpoche also conducted the World Peace Prayers Ceremony at Kyichu Lhakhang in Paro, Bhutan annually. Apart from this, Rinpoche is a great poet and has composed lots of poetries. Rinpoche travels to eastern and western countries and give teachings for the benefits of sentient beings and to uphold the teachings of Lord Buddha. Based on the standard teachings of the past spiritual masters of all the Buddhist traditions, he composed text on the stages of cultivating bodhichitta and profound emptiness, entitled the Feast of the Fortunate Ones: The Wise Counsel Demonstrating the Essential Points of the Innumerable Teachings. His other works include the Experiential Spiritual Songs and more then one hundred pleasing and meaningful poems. He also composed a history of the Taklung Kagyue tradition and many biographies and wrote commentaries on the great treaties.